Height18 inches (36 inches when in bloom). FoliageTidy clumps, fine blue-green foliage. Flower FormPurplish-red inflorescence, diffuse silky panicles 18 inches high. BloomsLate Summer to mid Fall for 6 - 8 weeks. PruningIn late winter to early spring, cut back old foliage down to a few inches above the base of the plant for a neater appearance the rest of the season. Late winter to early spring. 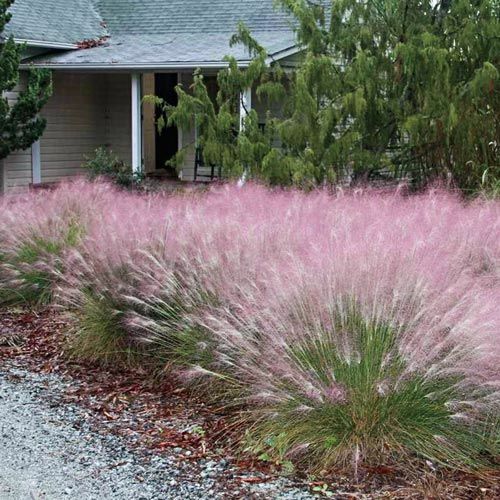 CommentsDelicate pink plume seed heads appear in late summer and completely envelope the foliage. 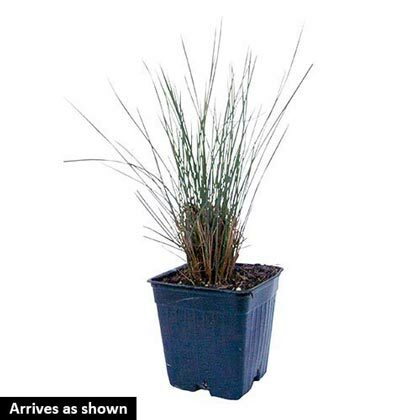 Instantly transform the look of your garden by adding easy-care ornamental grasses. They make stunning focal points, graceful borders or perfect complements to your other plantings. In late Summer this tough grass sends up light airy pink plumes. One of the most showy grasses for the landscape. Because of its tough nature it can be planted just about anywhere. It tolerates heat, humididty, drought and wet conditions. Forms neat clumps of narrow foliage in Spring and Summer, then in late Summer it becomes one of the most stunning plants around! Airy plumes of cotton-candy pink float above the foliage, and they hold their color until Fall is over. Extremely easy, thriving despite heat, humidity, drought, even poor soil! Grows 3 feet tall and 2 1/2 feet wide. Muhlenbergia capillaries.